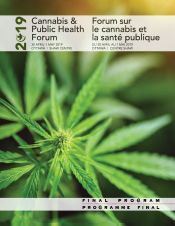 The 2019 Cannabis and Public Health Forum will bring together public health professionals, researchers, policy-makers, academics, students and trainees to share the latest research, best practices and innovative policies that support a public health approach to the legalization and regulation of cannabis in Canada. The two-day forum will feature a variety of peer-reviewed sessions generated through the call for submissions. The Forum will be held concurrently with Public Health 2019, the annual conference of the Canadian Public Health Association. Delegates who registered for the Forum will be able to register for Public Health 2019 at a reduced rate. As the Forum has a limited seating capacity, registered Public Health participants are currently not permitted to attend Forum sessions. Oral and poster presentations, selected based on the results of the open call and peer review process. A multisectoral knowledge exchange forum and networking opportunity. Identify strategies for knowledge translation and exchange. Anyone who is interested in advancing a public health approach to the legalization and regulation of cannabis should attend this forum. It will be the meeting place for a wide range of disciplines and sectors, at various career stages, all striving for a common goal. Individuals with commercial interests in the cannabis industry are welcome to register for the Forum; however, a cap of 10% of the total delegate registration has been established for such individuals. Individuals with commercial interests in the cannabis industry should complete the registration process, and their acceptance as delegates will be confirmed on 18 March 2019. Due to the limited seating capacity, Forum delegates are not permitted to attend Public Health 2019 sessions unless they are a registered Conference delegate. If you wish to attend one day of programming at Public Health 2019, we offer discounted daily rates. At the time of registration, you will be required to select the Forum of your choice and your dates of participation for Public Health 2019. Proof of full-time student status required. For online registration, a Visa or MasterCard is required to complete the transaction. To request an invoice payable by cheque or credit card, contact phforums@cpha.ca. We are pleased to offer a rate for participants from Indigenous communities. Contact phforums@cpha.ca to learn how to register. We are pleased to offer a discount for staff registering from the same organization. Contact phforums@cpha.ca to learn more. One invoice will be issued per group registration, payable by cheque or credit card. If an invoice exceeds $1,500 and an organization wishes to pay by credit card, a 2.5% surcharge will be applied to recoup the service fees charged to process the transaction. Once payment is received, group participants will be issued a unique registration link. Separate registrations must be completed for each delegate. The 2019 Cannabis and Public Health Forum is held concurrently with Public Health 2019, take advantage of discounts available for travel and accommodations in Ottawa.